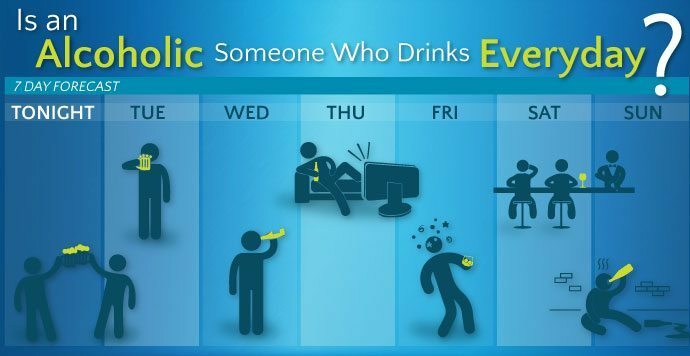 Is An Alcoholic Someone Who Drinks Every Day? Home › Blog › Is An Alcoholic Someone Who Drinks Every Day? It is estimated that one in twelve Americans have a problem with alcohol abuse or dependence. When searching for a definition of what constitutes alcoholism, one thing is clear: it is not only how often you drink, but also the manner by which you drink, the quantity in which you drink, and the effects of drinking on your life, that allow for the idea of addiction or alcoholism to be applied to alcohol consumption. Dietary Guidelines for Americans considers the following to be moderate consumption: up to one drink per day for women and up to two drinks per day for men. However, the National Institute on Alcohol Abuse considers low-risk drinking as “no more than 3 drinks on any single day” for women and “no more than 4 drinks on any single day” for men. It is important to note that this standard applies to a singular day, and is not intended to be a guideline for usage over the course of several days. If, for instance, a woman consumed three drinks every day for a week, totaling 21 drinks, she would be severely over 7 drinks per week; which is considered the maximum amount to stay within the low-risk category. The National Institute on Alcohol Abuse and Alcoholism defines binge drinking as “a pattern of alcohol consumption that brings the blood alcohol concentration (BAC) level to 0.08% or more.” Binge drinking occurs when alcohol is generally consumed within a two-hour period at the rate of four or more drinks for women and five or more drinks for men. Heavy drinking reflects on an individual’s weekly consumption; for women that amount is eight drinks or more, whereas for men it is fifteen. When considering an individual’s drinking habits, it is important, no matter what the frequency, to be on the lookout for these warning signs: routine drinking, changes in habit, and physical changes. When any or all of these behaviors become present it can be indicative that social drinking may have progressed into the more dangerous realm of alcohol abuse, or dependency. Is There A Difference Between Alcohol Abuse And Alcoholism? Yes. And when considering the ramifications of alcohol use on an individual’s life it is very important to become educated and understand the similarities and differences between the two. Both alcohol abuse and alcoholism are harmful to your health; each require specific treatment and are best handled under the care of a trained professional. It is especially important to understand that alcohol abuse, if left unchecked to continue long-term, can turn into alcohol dependence. Above, we’ve outlined the generally accepted guidelines for low-risk, moderate drinking. Alcohol abuse is anything that surpasses this in amount or frequency. Alcohol abuse constitutes a pattern of drinking that negatively impacts your life. This behavior has harmful repercussions on health, both physical and mental, relationships, and also in one’s ability to perform work properly. For an individual addicted to alcohol, they have an excessive preoccupation with alcohol in regards to its use and effects. This mental absorption can result in both attention and responsibility being diverted away from crucial areas of a person’s life and commitments. As their functional tolerance increases, they find themselves drinking more to achieve the desired effect. They also find themselves committing increasing amounts of time to the cycle of drinking and recovering, while taking that time away from their relationships with others. For someone struggling with an alcohol addiction, they often lack the ability to cease or control their drinking. When they do stop, this sudden abatement is accompanied by physical symptoms, including: nausea, sweating, shakiness, anxiety, an irregular heartbeat, or even seizures. Alcohol is one of the most dangerous drugs to withdraw from. These dangerous withdrawal symptoms are called delirium tremens, or more commonly DTs; they may be potentially deadly. Please be advised, that anytime a person attempts to reduce or cease their consumption of alcohol, it is best undergone with the supervision of a trained, medical professional. How Do I Determine If I, Or Someone I Love Has A Problem? In addition, one of the simplest and most widely used tests is the CAGE questionnaire that follows. Answer the questions as honestly as you can. If you answered yes to two or more of the questions, it is quite possible that you may have a problem. It is important to remember that proper education is necessary to fully understand what constitutes alcoholism; the observation of a trained professional can be the most useful tool in determining the extent of an individual’s problem. We recommend that you seek help, to assist either you or your loved one navigate your situation and the treatment options that are right for you. Please contact us at AlcoholTreatment.net if you have any further questions about an alcohol addiction, its signs or symptoms, or if you would like information about entering into a rehabilitation facility. We are here to help you get on a healthy path to recovery, so reach out to us today and get your life back on track.